Not being a Briton, I don’t believe I can weigh in on what constitutes a “proper” scone, but I do know that the ubiquitous dry lumps languishing in coffeeshop display cases do not tempt me. Except for one, a long time ago. I discovered the first scone-love of my life while working at a coffeeshop on Magazine Street in New Orleans called Café Luna for an opinionated cat lady named Nanette. She hated children but animals of any kind were welcome in the shop, and being more of a dog person than a child lover, this was fine by me. My favorite regular was a bulldog named Grendel that greeted me behind the counter with a sloppy full body wag each time she and her owner came in. In contrast, if a family with children came in she would order me to sweep around their feet in hopes that this rude gesture (which she expected me to make) would encourage them to vacate the premises. She also refused to allow me to bring people their orders but rather insisted that I yell from behind the counter because I was “a barrista not a waitress”. None of our pastries were made in house but were delivered to us each morning by a man that ran a small baking company out of his home. The delivery consisted of pastry case staples: croissants, pain au chocolate, cookies, bagels, and these large, triangular cranberry scones with a sparkling sugar crust on top. I don’t think I’d eaten a scone before trying his, or if I had previously eaten one it was, evidently, entirely forgettable. Those scones were a tender epiphany that I then described as “like a hybrid between cookie and cake”. I left New Orleans after Katrina, and when I returned years later I made a special trip to Café Luna specifically for one of those scones only to be told the man that baked them, like so many people, was no longer in New Orleans. I felt defeated and quickly accepted that I would never have a scone like that again in my life. At the time I identified strictly as a savory cook, not a baker, so trying to recreate them didn’t occur to me as an option. Game over, man. Game over. Over the years I forgot about those scones, and they became relegated to an invisible coffee house staple again. But over the years something else happened, I became bi-culinary, both avid savory cook and baker. Finally, with the first pint of the season’s blackberries on my counter and a half gallon of Cruze Farm’s buttermilk in my fridge (which is always in my fridge), it dawned on me, quite out of no where, to try my hand at scones. As always that resulted in scone research, as I rarely just go to it making the first recipe I come across. A lot of reading later, I settled on an adaptation of a Cook’s Illustrated recipe. It received good reviews, and I trust their rigorous testing besides. That and the step in which you freeze and grate the butter reminded me of grating the frozen dough for Julia Child’s Hungarian shortbread, which produces a very light, crumbly texture. It also reminded me of pinching butter into my biscuits and cutting it into pie dough. In short it plainly indicated one thing: tender. After having made them a few times now, I can happily say that I’ve found another scone to love. My understanding of the scone has evolved from “cookie cake” to a relative of the biscuit. Made with buttermilk, sour cream, butter, and a touch of heavy cream, these scones do not pretend to be healthy, and their fat content relative to the flour is so high they almost melt when baking. Almost. That said, they freeze beautifully so there is never any need to make a big batch of them unless you’re cooking for a crowd. I usually bake one or two which we eat while still warm and freeze the rest. Freezing them is also nice because scones do not age particularly well and benefit from being eaten within 12 hours of baking. That all said, I think these are the best scones you will ever have. Honestly. They’re a wonderful albeit indulgent breakfast and an excellent stage on which any number of fillings can shine, my favorite being fresh berries which results in the lyrical “jammy pockets” rhapsodized by Kate (of Cookie + Kate). This recipes is infinitely adaptable and well suited to cooking with the seasons because it can be filled with any thing really: chocolate chips, nuts, dried fruit, fresh fruit…whatever is delicious, in season, or on hand. You can also flavor the dough with any number of herbs, citrus zests, spices, etc. It’s a blank slate. Have fun with it. 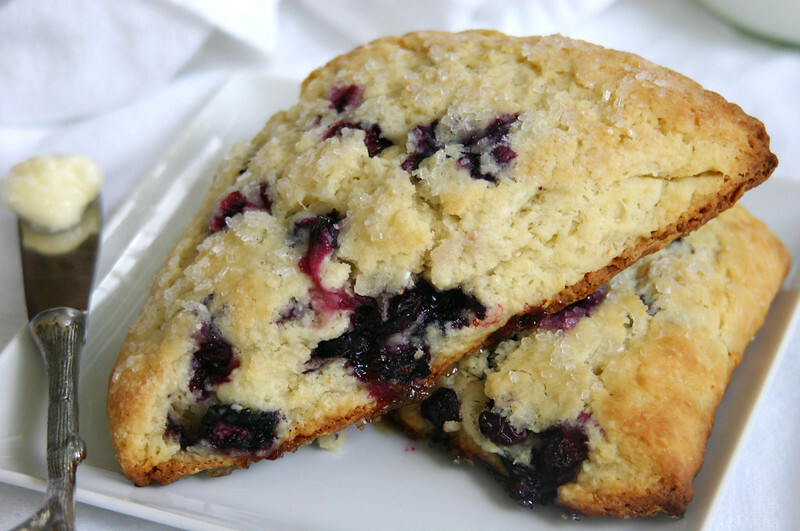 Pictured here are blueberry lemon zest scones (his favorite), but I have also included the variation for blackberry thyme scones (my favorite). Note that as with biscuits I think it’s important to handle this dough gently. It’s quite sticky so use flour liberally but only as needed, and I opt to use my hands as opposed to a rolling pin and bench scraper when forming the scones as I find it’s gentler. Whisk together the buttermilk, sour cream, and heavy cream in a medium bowl; refrigerate until needed. Combine the flour, ½ cup sugar, baking powder, baking soda, salt and lemon zest (and thyme if using) in a medium mixing bowl. Whisk to combine. Add the grated butter to the flour mixture and toss with fingers until thoroughly coated. Add the milk mixture to the dry ingredients and fold with a spatula just until combined. Transfer the dough to a generously floured work surface. Dust the top of the dough with flour and form the dough into a ragged ball, kneading lightly as needed. Add small amounts of flour as needed to prevent sticking. Roll the dough (I simply pat it out gently with my hands) into a 12-inch square. Fold the dough into thirds like a business letter carefully, making sure it isn’t sticking. Fold the short ends of the dough into the center in thirds, to form an approximate 4-inch square. At this point the dough can be transfer thto a plate lightly dusted with flour and chilled in the freezer for 5 minutes to make it easier to work with (I skip this step). Return the dough to the floured work surface and roll (or pat) into an approximately 12-inch square again. 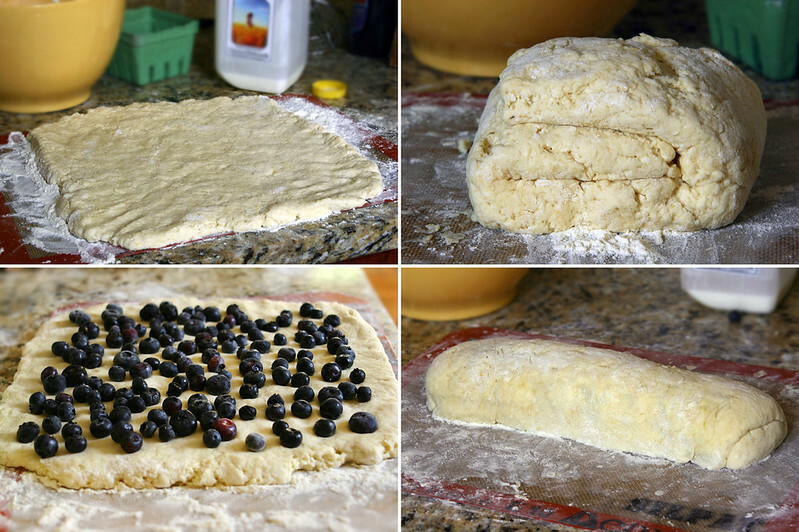 Sprinkle the blueberries (or blackberries) evenly over the surface of the dough, and gently press down so that they are slightly embedded in the dough surface. Sprinkle with 1 tbsp of sugar. Gently roll the dough up to form a tight log. Lay the log seam side down and carefully press the the log into a 12 by 4-inch rectangle. Using a sharp, floured knife or bench scraper, cut the rectangle crosswise into 4 equal rectangles. Cut each rectangle diagonally to form 2 triangles. Transfer to a parchment lined baking sheet. Brush the tops of the scones with melted butter and sprinkle with sugar. (If freezing ahead of time, flash freeze on the baking sheet for 20 minutes, then wrap individually and store in a freezer bag until needed. To bake from frozen bake directly from freezer for about 20-27 minutes. Do not thaw.) Bake until the tops and bottoms are golden brown, 18-25 minutes. Transfer to a wire rack and let cool 10 minutes before serving. All scones are not created equal! This one looks superb! Look at all those jammy pockets! Pretty, pretty. 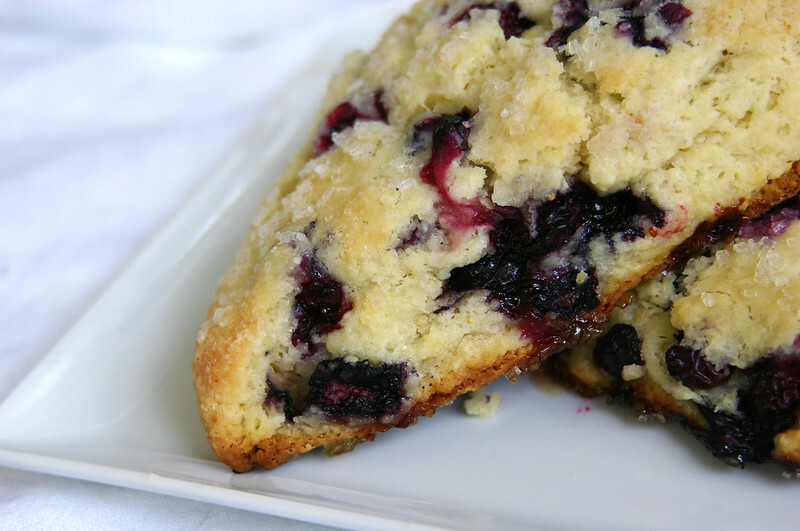 Berry scones might be the queen of breakfast pastries, and these are no exception! Beth, I have a few blueberries left to pick for this year. I will make a batch of your scones to honor this year blueberry harvesting. Beautiful Blog! Awesome. I’d love to hear how they turn out! The heavy cream is 1/4 of a cup?? Thanks! It looks great. I usually use about 1/4 cup, yes. I gauge it by the stickiness of the dough. I’m glad you liked them! They are hands down my favorite. I made scones for the first time and they are absolutely delicious. Thank you for the great recipe. The pictures and your thorough explanations were just as great! This was the first attempt I have ever made at baking scones. I always assumed they were touchy and difficult but I really wanted to try the blackberry thyme. I am sooooo glad that I did! These are the ultimate! I’ve gotten rave reviews from everyone I’ve made them for. I’m going to work on several variations including sweet and savory. I can’t wait to see how adaptable the base dough is! Thank you! 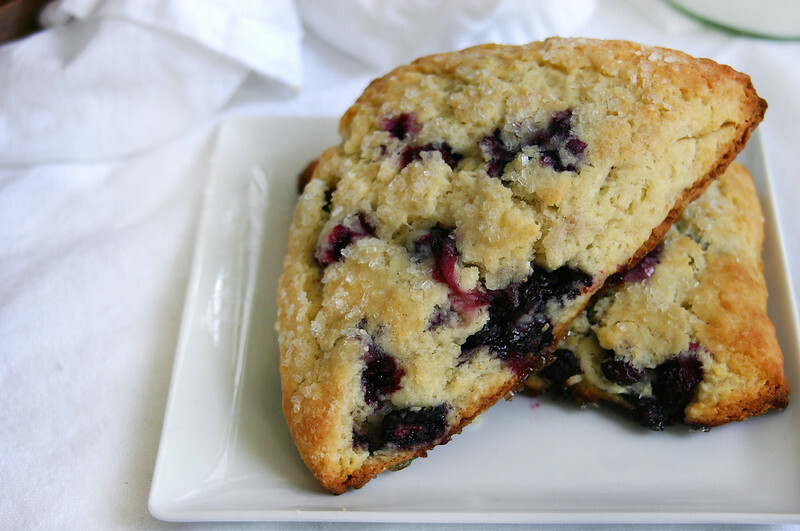 These are my favorite recipe for scones ever! I would love love to hear about your variations. I’ve been meaning to do another post about these w/ different flavors. I love your recipes. But I think you should write a book . You have a way with words that is a gift. made these scones (my first time), with the leftover blueberry basil goat cheese mixture from your hand pies i made yesterday. unfortunately the mixture was a bit too wet and didn’t want the scones to stick together very much, but equally delicious. thanks for always sharing and making small home bakers feel like they can do big things! If your dough is wet, you can always really liberally flour the surface. It should be super moist but workable without falling apart. But you definitely want to work flour in after the fact. Looks great. How many scones I get from this recipe? 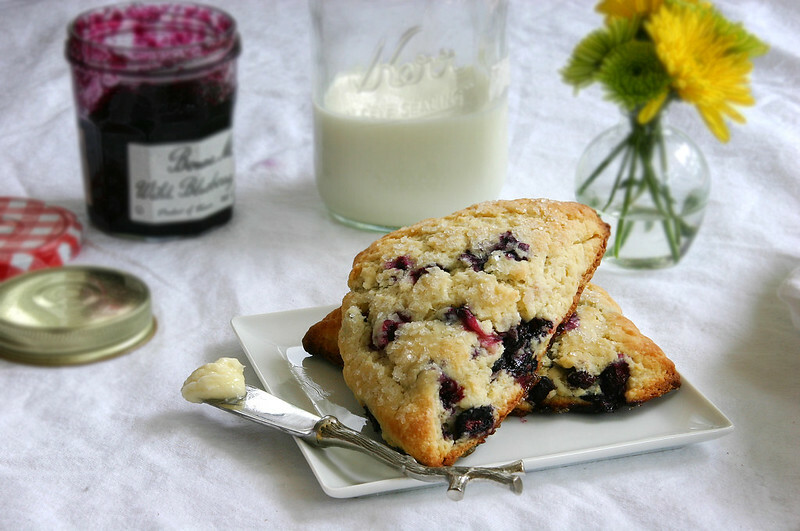 I am a Brit and this is one of the best scone recipes ever. I have all of these great tea cookbooks lying around my home but none of the scone recipes in them equal this one. I have made these with every type of berry imaginable as well as just plain and either way they are perfect. I am having a garden tea party this Saturday and plan on making about 4 batches of this recipe and I can’t wait! Made these twice: once as the recipe is written (with blueberries), and once with cinnamon apples. Both were EXCELLENT, and even my gluten-free mother sacrificed to have one of each. 😉 Thanks for helping me make my grandmother’s wish of scones come true! Love reading recipes but rarely ever make them, however I’m going to make an exception with this one. Good recipe, easy to follow, especially with pictures! I’ve always been averse to making scones because most of the time I’ve had really dry, under-seasoned scones, and they seemed too messy/troublesome to make. It is a little messy but containable. 🙂 My dough was very, very wet, (probably because I eyeballed all the wet ingredients!) but the scones came out large and moist and delicious! Even my husband, who is suspicious of things with berries or anything healthy in it, said he liked it. Thank you for sharing!